Today’s career for a better tomorrow. Energy efficiency is something everyone is striving to achieve. 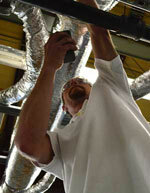 And home service technicians who are able to help homeowners achieve better efficiency are in demand. Become an Advanced Energy Analyst and help homeowners make changes that can help save money and the environment. Advanced Energy Analyst is the first level of certification in the Building Performance Institute (BPI) training. It is recommended that if you need BPI training, you should begin with this course. If you've already been certified in BPI, check out our BPI Continuing Education to find out how to advance your skills even further. Not sure what training you need for the work you will be doing in home performance? You might consider the basic BPI Building Science Certificate. This is a great introduction course to home performance and typically guides the student on future training levels needed. Entech has been approved by the Connecticut Office of Higher Education. The program is provided in conjunction with The School for Energy Efficiency located in Waterbury, CT. The school is a certified BPI test center with two classrooms, an on-site field house for testing and a computer lab for online testing of up to 20 students. Currently we are undergoing some internal reorganization at The School for Energy Efficiency and cannot offer as robust a schedule as you are used to seeing. If you wish to be alerted when we add classes to our schedule, please fill out the contact form to the upper right and let us know. We apologize for any inconvenience. Learn More About Becoming an Advanced Energy Analyst.